26 October 2018 | The Intergovernmental Panel on Climate Change (IPCC)’s recent Special Report showing that we may have little more than a decade before global warming exceeds 1.5°C is rattling. A finding that’s received less attention but is equally critical is that there is no pathway that keeps us under 1.5 degrees without active carbon removal from the atmosphere. In other words, cutting emissions is not enough. We need to increase carbon sequestration too, dramatically. That finding is renewing interest in halting the loss of tropical forests, which would not only eliminate a key contributor to climate change but also begin to rebuild carbon sinks. A wave of major corporations have stepped forward in the last five years with voluntary pledges to eliminate deforestation in their commodity supply chains. To date 346 companies, spanning the global network of producers to retailers active in the four commodities most responsible for deforestation and land degradation: cattle, palm, pulp & timber, and soy, have committed to addressing legal & illegal commodity-driven deforestation. These voluntary actions have been initiated and supported by leading industry and multi-stakeholder groups like the Consumer Goods Forum (CGF) and Tropical Forest Alliance 2020 (TFA2020). While voluntary commitments are all well and good, half of tropical deforestation for commercial agriculture is actually taking place illegally – in violation of producer country laws – and regulatory solutions are therefore badly needed. Around half of the illegal forest conversion for commercial agriculture is driven by exports, to meet consumer demand in Europe, the United States, China, and other markets. For companies that want to purge deforestation from their supply chains, tackling illegal deforestation is a necessary first step. The potential impact would be enormous, and tropical forest countries like the idea, since many are under-resourced in the fight against illegal logging and want to continue promoting economic development in the agricultural sector. And whether or not corporate leaders want to position themselves as environmentalists, no one wants to be associated with crime. But forest legality is just one item in the package of commitments that corporations are making. Commitments often include other goals like “zero” or “zero-net” deforestation, product traceability, and human rights safeguards. How much should companies focus on legality relative to these other goals? What exactly is the difference between “zero” or “zero-net” deforestation and illegal deforestation? Illegal deforestation simply means that timber or timber products have been harvested, processed, or traded in violation of producer country laws. For example, an entity could be logging in protected areas, High Conservation Value Forests, or in other places where they do not have the necessary permits. Or they could have a permit to harvest or process logs but there is corruption or fraud present in some other form, such as bribing officials for permits or not paying taxes or export duties. Logging is also considered illegal if forests are being logged in violation of laws designed to prevent negative impacts on environment or local communities, such as harvesting above what’s allowed by quotas. Illegal deforestation is a much bigger driver of global forest loss than you may think – and it’s driven by demand for products you probably use every day. Our work has shown that nearly half (49%) of all recent tropical deforestation is the result of illegal clearing for commercial agriculture. Roughly 90% of deforestation in Brazil between 2000 and 2012 was actually illegal. The same is true for as much as 80% of forest loss in Indonesia. Much of this illegal destruction was driven by overseas demand for commodities including palm oil, beef, soy, leather, and wood products. In response, legality is often a leading element of corporate policies to address commodity-driven deforestation within their supply chains. Meanwhile, “zero” deforestation means that no forests anywhere have been cleared or converted for agriculture or other uses. “Zero-net” deforestation means that while forest loss may have occurred in one place, an equivalent amount has been replanted somewhere else, so that overall forest cover remains the same. You’ll often find “zero” or “zero-net” deforestation commitments made by corporations regarding their supply chain. 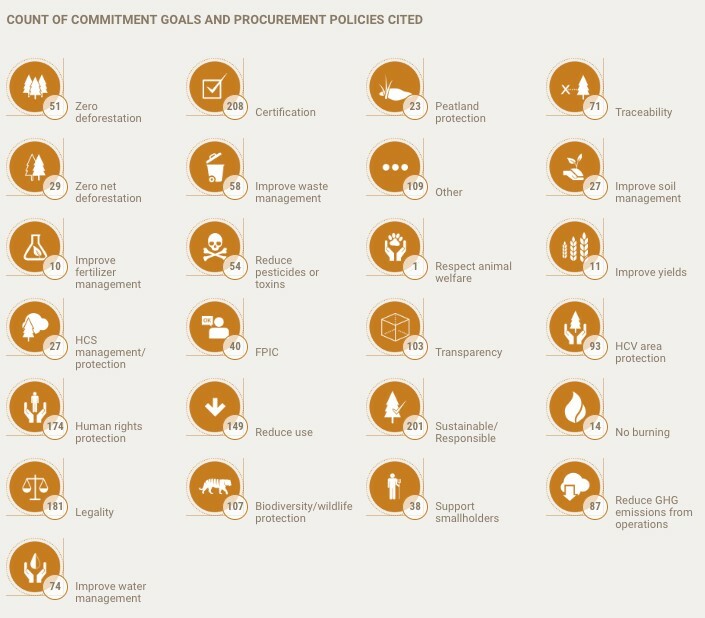 These commitments might refer to one more of the following agricultural commodities associated with deforestation: pulp & timber, beef, soy, and palm. Commitments might also vary by scope (applying to some or all of a company’s product lines or brands, and to just the company’s operations or also its suppliers’ operations). Zero and zero-net deforestation commitments may also be paired with policies to ensure legality, to protect high-value areas, source only sustainably/responsibly produced commodities, safeguard human rights, or transparent/traceable procurement. Therefore, while legality may be specified as part of the commitment, unless specified by the company, “zero” or “zero-net” deforestation commitments don’t necessarily tell you whether the commodity in question was produced in compliance with forestry laws in producing countries. That’s why it’s necessary to gather a plethora of company commitment data in order to get the full picture, you can learn more about the range of corporate supply chain commitments at Supply-Change.org, a Forest Trends platform that tracks these commitments. See example below for how legality commitments comprise a significant share of corporate timber & pulp commitments to address commodity-driven deforestation. Tackling illegal logging and deforestation can complement voluntary corporate sustainability efforts. Addressing deforestation ultimately means working with the government in forested countries that produce timber and other commodities like beef, palm, or soy. And these governments may actually be more receptive to efforts to address illegal logging than to make supply chains more sustainable, since the former means additional help in enforcing their own laws and agendas, rather than supporting an international company’s sustainability agenda. Legality approaches could in theory include much-needed financial and technical support for law enforcement, which is often under-resourced in protected areas in the developing world. Legality approaches also force us to address hard-to-solve problems that voluntary actors might otherwise prefer to avoid, such as illegal land grabs in violation of local and indigenous land rights. But since forests where indigenous land rights are legally recognized have both lower rates of deforestation and higher-than-average carbon storage, taking steps to track illegal forest-to-agriculture conversions by improving land tenure rights and registration would address human rights abuses and climate mitigation at the same time. That’s a compelling argument for prioritizing legality. An even more compelling argument? Illegal deforestation creates huge financial losses, undermining countries’ development objectives in the resource sectors. At a minimum, producer countries lose out on $4,000 per hectare from just three major factors: tax evasion, the loss of ecosystem function, and conflict with forest communities. Globally, illegal deforestation for commercial agriculture generated losses of over $17 per year during the early 2000s to forested countries. But legality is only a part of the larger goal of sustainability. After all, “legal” can still be unsustainable. Many advocates for forest conservation have expressed concern that focusing international efforts on forest legality would be a step backward, since most voluntary action on supply chains today pursues the more ambitious goal of “sustainable” or “responsible” commodity production. Producer country legal frameworks can be confusing, with sub-national regulations contradicting those at the central level. Indigenous and community land rights are often unrecognized under statutory law. And exemptions carved out by powerful actors have enabled large-scale land acquisition, or “land grabbing,” in a way that’s 100% legal. Recent recommendations on reducing consumers’ impacts on deforestation from the European Commission and the NGO community both see legality as an intermediate milepost on the road to sustainability. Still, since the evidence suggests that so much deforestation is illegal, halting illegal logging could be a bigger step forward than the conventional wisdom holds. Illegality is hard to spot for many agricultural commodities. It’s often very difficult to prove that illegal forest conversion has taken place. Experts say that it may be easier for governments and companies to crack down on illegal timber itself instead of trying to spot illegal conversion in agricultural supply chains. After a few years in the wilderness, legality may be back on the agenda. Attention in recent years has mostly focused on voluntary approaches on deforestation like TFA 2020, CGF, and individual corporate commitments. But signs that companies may not meet their voluntary commitments by 2020 as planned, along with increased interest in the forest-climate link, may be reviving it. As forests and land-use gain traction as a cost-effective, scalable climate strategy in the international arena, and forest countries pursue their own goals for reducing deforestation as part of their Paris Accord pledges, forest governance is an unavoidable issue. Many countries will need to put in place new legal frameworks for forest management to meet their climate objectives. Linking consumer-country trade policies, including legality requirements, to these climate plans could help support forest countries to both enforce existing logging laws and meet new climate goals. Similarly, capacity-building for REDD+, with its emphasis on legal frameworks, land tenure and registration, and land-use planning, requires countries to improve forest governance – which is also necessary to stop illegal logging. Voluntary action is important: early leadership can help to test new approaches and certification schemes, demonstrate that that sustainability doesn’t have to have a significant impact on costs or operations, and make important inroads engaging forest country governments and providing them with technical and financial assistance. But ultimately voluntary action can’t take on deforestation at the global level alone – at some point national and international policy and regulation will need to come into the picture. Our climate, and forest countries’ economic development, depends on a shift towards the rule of law.